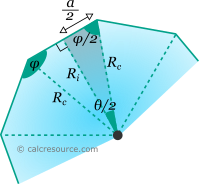 This tool calculates the basic geometric properties of a regular convex n-gon, that is a polygon having n sides and n vertices. Regular polygons are equilateral (all sides equal). The tool can calculate the properties of any convex n-gon, given the length of its sides, or the inradius or the circumradius. Enter below the shape dimensions. The calculated results will have the same units as your input. Please use consistent units for any input. N-gon is a polygon having N sides and N vertices. An n-gon is regular when all its sides are equal. The smallest regular n-gon can be considered the regular triangle, with three equal sides (equilateral triangle). The regular quadrilateral polygon is the square. The discussion in this page is about convex polygons (all interior angles are smaller than 180°). Regular polygons can also be non-convex (stars). where N the number of sides and vertices. For non-trivial cases it is assumed that \(N \ge 3\). where θ the central angle and α the side length. For a regular n-gon, central angle θ is 2π/N. 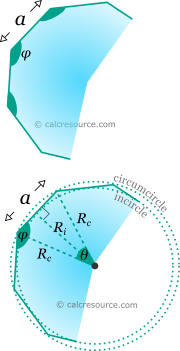 The above relations reveal that for large values of N, the inradius Ri asymptotically tends to the cirmumradius Rc (because θ approaches zero, and the cosine of the third equation approaches unity). It can be visualized that for large N's, the polygon looks very circular in shape, and therefore its circumcircle and incircle match more perfectly with it and as a result with each other. In the following table, the properties of some key n-gons are listed.